Sideline judge rushes in to signal a timeout and stoppage of play. I chose this first photo because for some reason the position the referee is in intrigues me. The shadow he casts is interesting too. 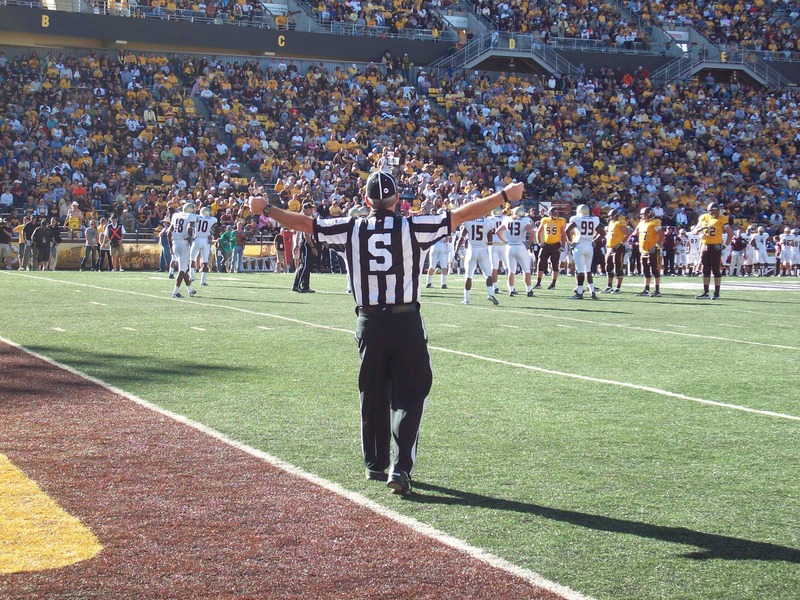 Having the referee in the foreground really causes the background of the team and the crowd to be at a different angle than normal sports photography. 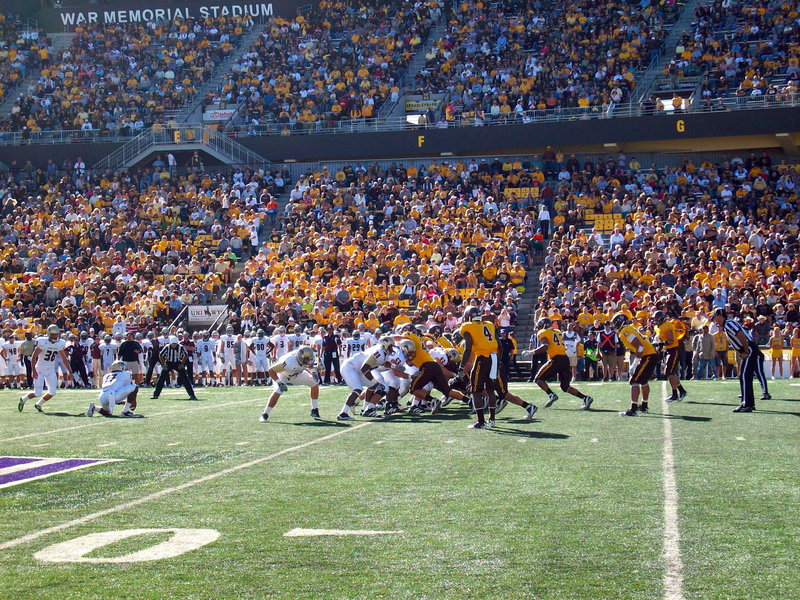 Texas St. attempts a field goal in the first quarter Saturday. This second photo is one of my all time favorites of athletic events that I’ve taken. I was trying to get a shot of the football leaving the kicker’s foot, but it still turned out pretty cool. Having the defensive linemen crashing into the offensive linemen makes for an interesting scene. The portion of the stadium in the background looks to be filled as well, which helps make the picture seem to have more importance. Two girls all bundled up playing on the swing set outside their home. 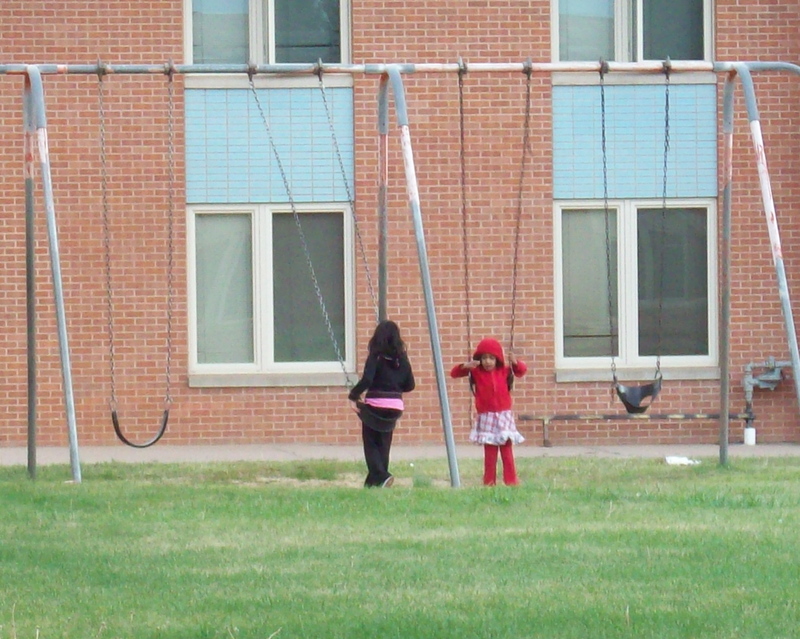 I was driving by the apartment complex by the old student housing across from the baseball field and saw these little girls playing on swing set. I waited for awhile for them to actually swing and whatnot but they seemed to be in deep conversation about who knows what. Capturing that moment was cool because it makes you think about what on earth they could be discussing. 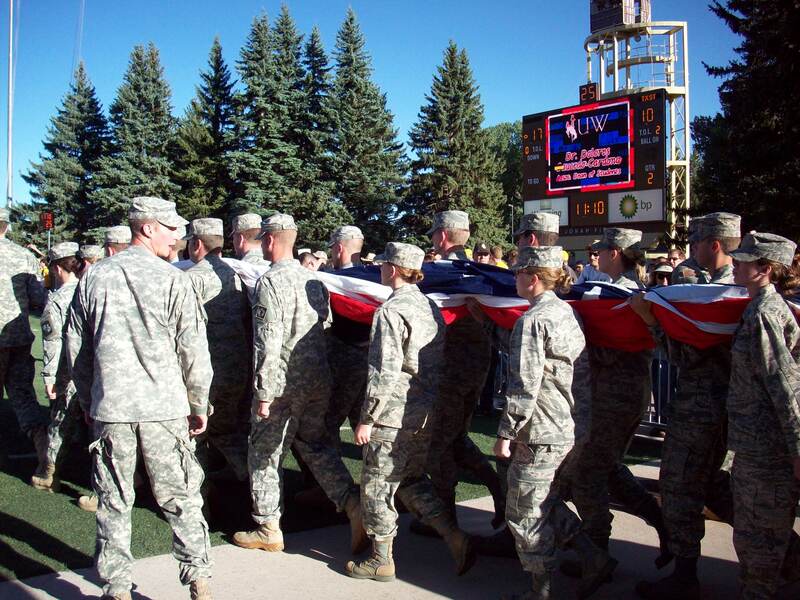 Members of the Wyoming National Guard carrying the US flag onto Jonah Field for Military Day during the Wyoming vs. Texas St. football game. 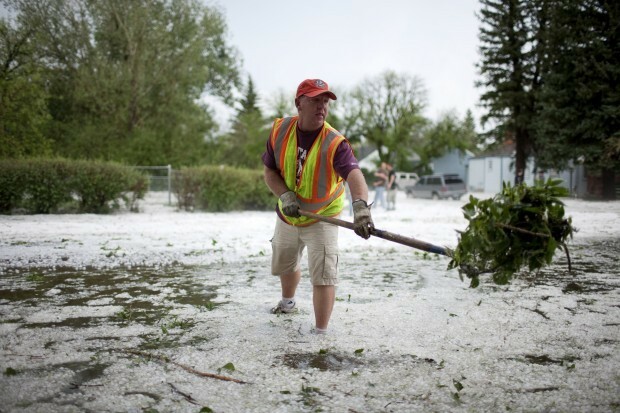 This particular photo has a deeper meaning than the others because of what these members of the Wyoming National Guard are doing. They are all carrying a large American flag during halftime of the Texas St. vs. Wyoming football game. That day, September 10th, was Military Day and obviously the day before September 11th. The crowd was in an almost somber mood during this presentation. It was very cool to be apart of this, as the National Guard Band was standing directly behind me and the time of this picture. 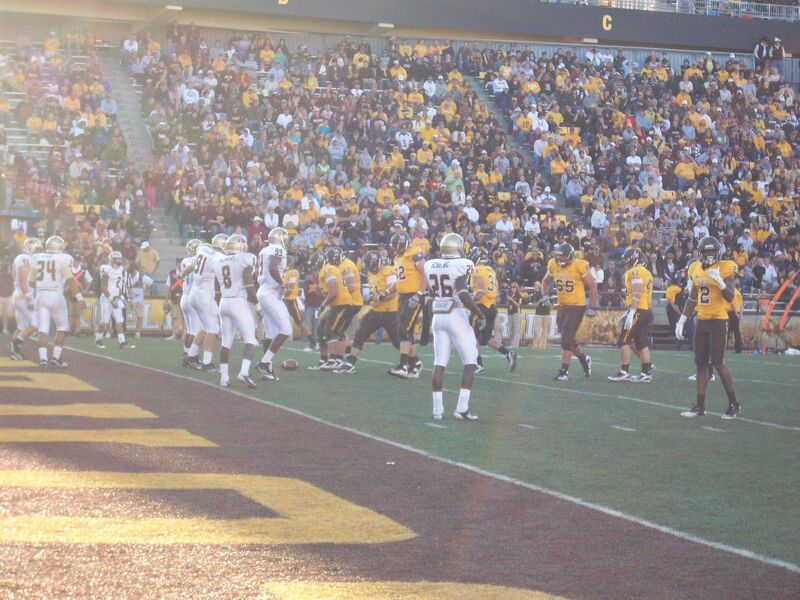 The Wyoming offense looks to tack on points on their already big lead in the second half against Texas St. In this photo, having the players moving into place, shows me that a play is about to happen. I know that they score on this play, so to me it gives off somewhat of an intense feeling. I can sense the intensity on the field. For example, the defensive players are scrambling to get into place and Mazi Ogbanna (#2 for Wyoming) is pointing to the side judge to make sure he is lined up onside. There is a lot going on in this picture, and to me, all the detail is interesting. Here are my first 5 photos I chose. Only up until recently, have I started to check the news daily. For awhile, I didn’t read, watch, or listen to the news with any intentions because of the high rate of just sad/depressing news. Because of my love for athletics, I immersed myself only in sports news. I took News Writing and Reporting a couple semesters ago and that class forced me to pay attention to daily news and current events. So now, I stick to getting my news from online, particularly cnn.com. No real reason why CNN, I suppose I like the layout of the website and whatnot. I do sometimes check BBCnews.com because I enjoy the European point of view and aspect to world news. It’s easier to check news from Greece, where my family is from through BBC. I still don’t watch the news, unless there’s major news that intrigues me. The only politcal tv show I do enjoy however, is Real Time with Bill Maher on HBO. Bill is pretty funny and I enjoy the back and forth banter about current issues. It makes it easier for me to watch that way. Sports news is my go-to, as I get almost all of my news from Twitter. I follow a vast amount of sports reporters who give me news and such at least 10 hours a day, everyday. I also visit numerous websites, deadspin.com, sportsbybrooks.com, and ESPN.com. I refuse to watch ESPN however, because of it’s lack of journalism integrity the past couple years. I do watch the sporting events on ESPN and Sportscenter sometimes. My favorite news sports talk show is The Dan Patrick Show — as he is my favorite sports news celebrity.